Roughly the size of a sports utility vehicle, the environmental satellite launching from America's western spaceport Friday morning carries a suite of modernized instruments to see Earth's weather with crisper clarity than its decades of predecessors. The NPP spacecraft will ride a United Launch Alliance Delta 2 rocket into its orbital vantage point, looping from pole to pole some 512 miles up. 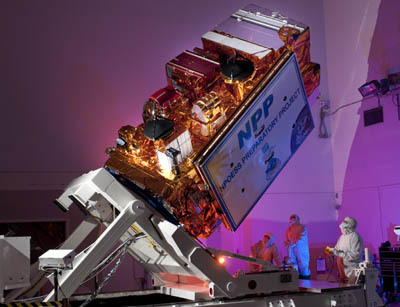 Built in Colorado by Ball Aerospace, NPP is the experimental precursor to the planned next-generation of weather and climate spacecraft that NASA and NOAA have begun developing, known as the Joint Polar Satellite System. 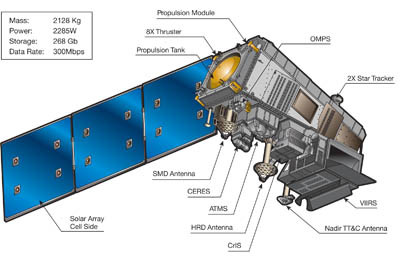 "It will fly five instruments -- VIIRS, CrIS, ATMS, OMPS and CERES -- which will collect data on atmospheric and sea-surface temperatures, humidity soundings, land and ocean biological productivity, and cloud and aerosol properties, along with Earth radiation budget data. These data will contribute to long-term data records in support of monitoring climate trends," said Andrew Carson, NASA's NPP program executive. Weighing 2.5 tons and measuring 13 feet long and 8.5 feet wide, the craft has a hydrazine fuel tank at its core for feeding 8 maneuvering thrusters. It uses Firewire for onboard data transfers, communicates with the ground via S- and X-band frequencies and runs on solar power from its three-panel wing that gets deployed minutes after reaching orbit. "Data will be transmitted to the ground-receive station in Svalbard, Norway, and brought back to the U.S. via fiber-optic cables. From there it will be sent to both the Air Force Weather Agency and the NOAA Satellite Operations Facility where it will be processed and provided to scientists and meteorologists around the world," Carson said. Four of the instruments are updated versions of previous spaceborne devices, while the fifth comes from earlier NASA observatories. The Visible/Infrared Imager Radiometer Suite (VIIRS) will produce those familiar pictures of clouds, plus take sea-surface temperatures for hurricane forecasting and perform land and ocean color surveys. This advanced environmental instrument is 10 years in the making. "It provides data products that result in action," said Warren Flynn, VIIRS program director at Raytheon. "It provides four times better spectral resolution, three times better spatial resolution, seven times better sea-surface temperatures. It has a fully calibrated day-night band that gives us better weather coverage at night. It is taking visible radiometric imagery to the next level." The Advanced Technology Microwave Sounder (ATMS) is another state-of-the-art instrument representing next-generation technology built smaller and less massive than before. "What's unique about microwave sounders is (they) can see through clouds. We see all the way to ground. We provide that water vapor, temperature, pressure profile from all the way on altitude to the ground," said Stephen Opel, civil space program manager at Northrop Grumman. "It is a significant amount of data that comes up through a 1.1-degree soda straw from the ground." The Cross-track Infrared Sounder (CrIS) is half the size and uses half the power of comparable spectrometers previously flown in space. "CrIS is a hyperspectral infrared sounder, which is a real fancy way of saying it takes a lot of channels of data (from) a very compact infrared device. It is the next in a long line of sounders that ITT has built," said Mark Poling, CrIS program manager at ITT Geospatial Systems. "It provides data to measure water vapor, temperature and pressure profiles from the ground all the way up to many thousands of feet. That allows numerical weather predictions to be much more accurate." The Ozone Mapping and Profiler Suite (OMPS) will provide three views to continue the long-term data record of ozone measurements from satellites. "It is called a 'suite' because there are three distinct instruments aboard. One is called the Limb Profiler -- it looks off the backend of the spacecraft looking at the orbit where we've just passed...The other two instruments are nadir that will look straight down from the bottom of the spacecraft. Total Column has a very wide field of view -- over 100 degrees -- and Profiler is a much smaller field of view -- around 16 degrees. Together these provide a total column of ozone from the stratosphere all the way down to the Earth," said Joan Howard, program manager at Ball Aerospace. "We also provide countless data modes so scientists will be able to mine the data for trace gas analyses and other things that we as engineers haven't even invented yet for scientists." The Clouds and the Earth Radiant Energy System (CERES) is the one instrument aboard NPP that is borrowed from earlier satellite missions to take the planet's temperature and measure the Sun's radiation reflected off Earth. "CERES monitors this radiance in three distinct wavelength bands -- a shortwave band that includes all of the solar reflected light, a longwave band that measures the thermal emissions and then a total channel that goes from the ultraviolet to the far-infrared that measures the entire radiance of the Earth," said Mark Folkman, Northrop Grumman's director of products and sensing. "These three sensor channels are scanned back and forth across the surface of the Earth at 30 km of spatial resolution day-in-and-day-out, day-and-night, all around the globe. The trick here is that measurement is done with an unprecedented amount of absolute radiometric accuracy. By measuring the reflected sunlight thermal emission on a global scale, scientists are allowed to monitor the temperature of the planet and validate the models that calculate the effects of clouds driving planetary heating or cooling." Given its testbed role in checking out these new instruments for their inclusion on the next-generation polar-orbiting weather and climate satellites, officials say it will take some time before NPP is fully operational. "There's over 30 data products from NPP. We expect to have some operational data within 18 months," said Jim Gleason, the NPP project scientist from NASA's Goddard Space Flight Center. "My guess (is) the most critical data sets will be much sooner, probably in the six-month timeframe for microwave radiances and longer for the more-complicated data products."